Past, present and near future. So the exhibition ended yesterday, all my work is back home and I managed to get some photos of the corset (collaboration with the wonderful stiletto heights) on my mannequin which I think shows off the shape much better. I am tempted to try it on but I think it may even still be a bit too small for me (curvy girl that I am!!) It will however probably be going into my etsy shop tomorrow. The exhibition website is up and running now and if you go to the exhibitor's page there is a rolling screen of many examples of many of the exhibitors work (it takes a wee while to fully load) and is well worth a look to get a general feel of the whole exhibition. I have gradually been putting the artwork into my shop today as it was starting to look a wee bit empty after a wonderful successful (for me!!) evening on Saturday where I participated in the Saturday Night Specials in the etsy forums. Unfortunately I won't be in it this saturday as we are away visiting Mark's parents (and I think etsying all night might appear little rude!!) but I can definitely see it being a fairly regular occurence in the future. So I did a workshop on 'The Role of Costume Design in Film' to a group of rather rowdy but brilliant teenagers last night who are working in a group with an organisation to make a couple of short films tackling teenage issues. It was great fun and I may pop along and watch some of the filming next week for a few hours to see how they are doing and also to see if any of what I said made sense! I have also been working once a month with a group of woman survivors (of various forms of abuse) and I am teaching them accessory making (bags etc) with a view to them setting up their own social enterprise to sell their work in order to raise funds to keep their group going. They are wonderful and to see them grow in confidence is just great. The work they are producing rocks and they are thinking about selling on etsy soon so I better watch out for the competition!! I hope they go ahead with it as I think it would be the ideal platform for them and their work. I guess the next 6 weeks I am going to have to take it easy a wee bit, (till pain relief injection and scan) but I shall enjoy the challenge of working from home. I also really need to begin contacting theatres and film companies again - it is so tedious and takes up so much time but I am really going to need to get some work for around then - so CV sending and internet hunting galore!! Fun times ahead!! Well I think I shall spend the rest of the day painting and making a few new ACEO's as I really want to stock the shop up and get some new artwork in there as well as bags (felted and fabric) and other accessories (cuffs and corsages). Maybe even a corset belt or two? Who knows what I will come up with. Infact I even have a wee idea brewing for a 'new for me' item which I am quite excited about so keep checking back!! My next planned project is a group exhibition with the arts group I am a member of and that is in May so I shall be updating you on that!! What a week, What a week!! Well my lovelies where do I even start!! Firstly I must apologise on my absence and lack of updates regarding the exhibition. Also for not being able to catch up on your blogs. So here is a roughly how the week has gone. Tuesday - Wake up at 7am - immediately so sick!! Mmmm all is not well. Try to get everything together to take exhibition and as well as feeling sick, back has also decided to give out and try as hard as I can - I cannot lift my mannequin!! Panic, what am I going to do!!! Okay I will lie down inbetween bathroom trips and cold sweats. Who can I call?? 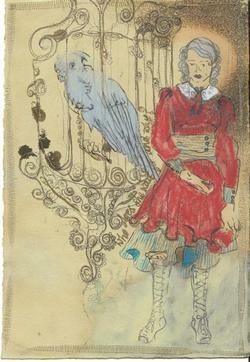 Mark is away working over night, everyone is working - there is nothing for it, I shall have to call exhibition. Tears of frustration. Dizziness. I am ill!! Tired? Yes, but also ill!!! So I have to wait till Wednesday. Mark comes back, I cry again. Lots of hugs, things are not so bad, the world has not completely ended after all. So after much sleeping we depart to take work to the exhibition. I am shaking like a leaf - have slept practically the entire day before. But nevermind we get there eventually. Exhibition is set up and I am so proud - and pleased with how it looks!!! The whole exhibition is more than I could have imagined!! Everything looks wonderful and the work is spectacular. (I wish I could take photographs but obviously I can't - although there may be exhibition photos on the exhibition website next week. I am so pleased with how the corset came out!! Stiletto Heights has made it to the UK!! Jenn's artwork looks incredible I think you will agree. 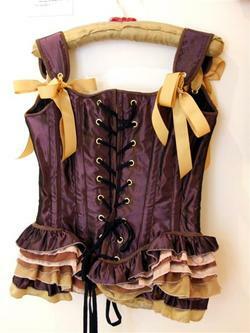 I really wanted to use lots of colour in this corset and I think the pink, purple and gold gives a very baroque almost carnival feel to the piece. Jenn I am actually rather nervous about you seeing the finished thing!! I really hope you like it!! 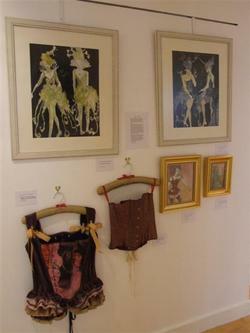 So I have one other corset as well as a full costume in the exhibition and also 4 framed pieces of art. The Follies costume is from my art college degree. 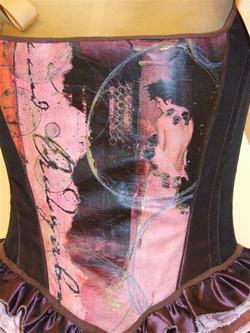 The corset I have hand painted and embroidered and the skirt is hand felted vintage lace. The unicorn headress is sculpted from wire with wool running through the framework and a hand made mask. 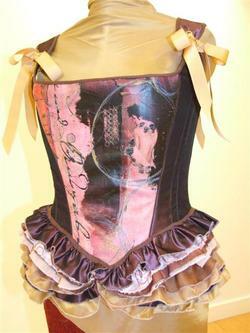 The other corset is again printed leather and is more of a victorian style. 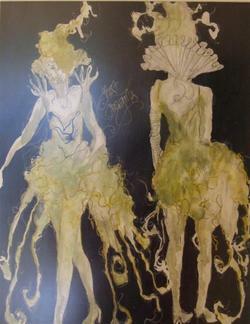 Two costume renderings (one of the follies costume) and 2 new pieces. Please excuse the terrible photos!! I plan to get more of the art corset taken on the mannequin when the exhibition comes down as you can't truly appreciate it till it is on a figure. And this is how it looks all together!! I am really please with how it all came out. BUT I didn't make it to the preview!! It was all just too much and I slept solidly for 2 whole days practically. Yuck I was ickily ill. Not good. I haven't even tidied my workroom yet. Infact I shall have to photgraph it as a lesson to myself to NEVER let it get in that state again!! So that is the exhibition!! I hope you like it and are not too sick of hearing about it! In other news, my appointment at the spinal unit came around much quicker than I had anticipated and I got a cancellation appointment today. The news is that I am going to need surgery probably in a couple of years but in the meantime they are going to inject my spine in about 6 weeks time and I am having scans. The injections will be every 3 months to numb the area so I should be 'almost' pain free and will be able to work etc. I only started my own business officially last october so it has been quite a worrying time that I have been earning practically zilch since the end of december as I have only been able to do the few workshops I teach and the occassional commission. Not a great start. But I am going to have a wee bit of an experiement next week and have an 'etsy' week whilst looking for theatre work. I really want to see how much I can make and list in a week and consequently how much I can sell (ha ha - now that is the HARD part!!). But the fact is I need to take a bit of a break until my injection and not push myself to do too much other work. I will still teach but I want to see how things go the next 6 weeks until my injection - then it will be full steam ahead (hopefully!!) and I will be able to start doing the occassional film again. So that has been MY week!! How has yours been?! Okay I have to be off now to prepare for a workshop I teaching tomorrow - sorry this has been a bit of a random/or overly focussed on me post. I am thinking of you all and am looking forward to catching up on all your blogs over the weekend. Work tomorrow, cinema to see 300 on Sunday and the rest of the day drinking tea and blog browsing. Bliss. A Wee Bit of Imagination!! Well my darlings!! How are you all? 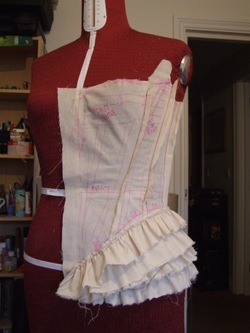 This again I am afraid is to be the shortest of posts but I so wanted to update you on the corset (and please forgive me for the lack of linky word thingies but I am so in a rush - things to do, things to do!! ) I feel like the rabbit from Alice and Wonderland!! I really want to thank you all for reading my blog and leaving lovely comments and just really being such wonderful people, working from home can be a lonely thing sometimes, but no longer when I have such truly incredible support and friendship here!! You are all lovely!! 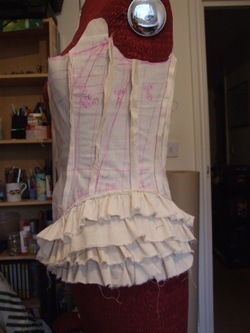 So here are a few update photos of the position of the corset as it was 2 days ago. I had hoped to be further on with it but alas (please forgive me for boring you with this!!) yep it was the week of being driven insane by my back etc. But here we have it nonetheless - and all I ask of you is to use a wee bit of imagination!! 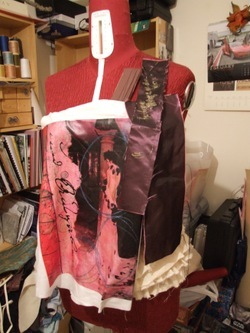 I love this stage actually, making the toile, as there is not other way to say it, but at this stage the 'prototype' always looks hideous!! And it can be hard to picture it in all it's glory in the final wonderful fabrics. I have made this pattern from scratch to fit around the image on the leather provided by the wonderful Jenn. 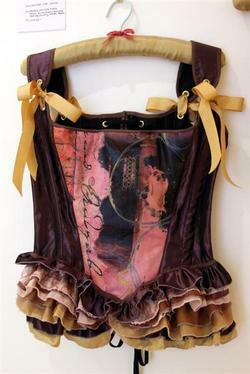 I had originally intended on handpainting and embroidering the fabric on the rest of the corset but after holding up samples against the leather I decided to let the artwork be the complete focus, I think it just stands out so beautifully and did not want to allow anything to detract from that. The fabric I am using on the rest of the corset is a wonderful dusky purple taffeta and the flounce is going to be hand dyed fabrics with a bit of gold in there too!! I did however add a little bit of gold fabric paint (just the absolute minimum!) 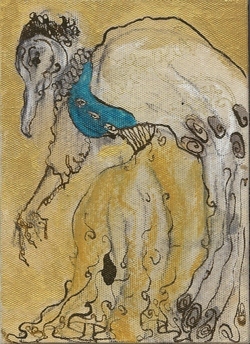 and some gold embroidery to the image (I hope you approve Jenn!!) just to tie it into the gold fabric that I have used in other places on the corset. I had to get some gold in there somewhere!! I am really ridiculously excited about this as well as being stupidly nervous about the whole exhibition. 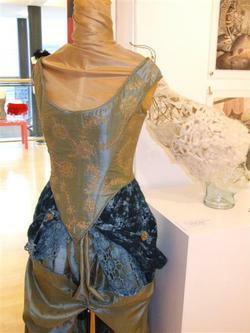 I am displaying one other costume (a follies costume I made at college - which feels a bit like cheating but I have been unable to make a new one due to health and finances - but I feel it does fit in with the theme of the exhibition). 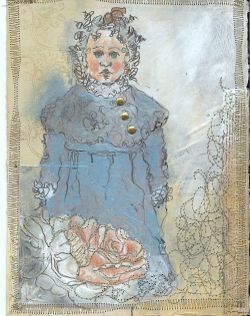 I have also been working on new pieces of artwork and am framing 2 large costume rendorings from the same previous project. So it all has to be finished tonight!! I am teaching a workshop this afternoon which I am so ill prepared for and it is over an hours drive away so how I am going to be able to focus on that I do not know!! I will be itching to get back home to get on with things. My poor lovely and adorable Mr Cox has just been wonderful the last week. He has been on holiday and has had to put up with my artistic temperament times 100 whilst making meals and supplying me with endless cups of tea and coffee etc. We did manage to get out for a lovely dinner on Friday and also went to the opticians for eye tests and I am getting 2 new pairs of beautiful glasses!! (Buy one get one free) which will be a godsend as my current pair are a disgrace. I was asked if I wanted contacts - but no frames are the thing for me - they are part of my appearance and I love them. Mark is getting glasses too for the first time and I cannot wait - he will look adorable in them. Okay back to work for me!!! Sorry for the lack of blog commenting etc. I will be back with all my heart and soul on Wednesday - with new photos of the exhibiton and finished work and cannot wait to see what you have all been up to. PS Vanessa - typepad has been acting like a petulant child for me again and I have been unable to leave comments on your blog!!! I am so sorry - but your shop looks wonderful - I am so proud to know you!! Emails will be sent shortly!! Oh and as for the 'sorry this is going to be a short post' idea at the top of the page - well clearly I am completely incapable!! Just a quick update from me today as I really have to get alot of work done!! I hope you are all well my dears. 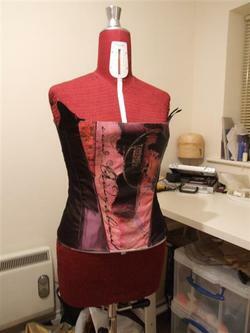 Will be working on the corset all day today and looking forward to making some headway with it. 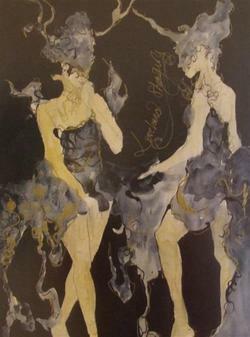 Going to be handpainting taffeta and free embroidering in gold metalic thread to contrast with the beautiful artwork by Jenn which has been printed onto the leather which will make up the front panel. I am going to be making a few small pieces of artwork too and as I really don't think I can take any time out to go hunting for antique frames I have found the next best thing in hobbycraft (I want to hate this store but actually it is continuously saving my bacon when I am desperate for some art materials or forget to buy something for one of the workshops I teach). They are very ornate and gold (oh I adore gold!!!) and are probably not anywhere near as nice as the real thing would be but I have gone for a bit of a baroque theme so they will look perfect along with my other costume and will just contain the small paintings beautifully. They are hideously expensive though so I can only afford a couple and can only get small ones but that is okay as I am quite enjoying working on small pieces at the moment. Isn't it funny, at art college I also wanted to work on large scale pieces when I considered studying fine art but since choosing costume I have found myself enjoying working on a smaller scale. These small circus themed art cards were listed in my etsy shop yesterday - and although I have listed them separately I would really love them to be bought as a set - they are a family and as such could not bear to be parted from each other after all!!! Right that is it - off the work room for me!!! Why is it as soon as I contemplate working my tummy starts to make desperate noises of hunger?? Well my dears!! How are things with you? I hope life is good and all is well. The weather has been so beautiful here the last few weeks - so unlike the UK!! But every day even though it should really be the middle of winter - the sky is blue and it is gloriously sunny with just a bite in the air. 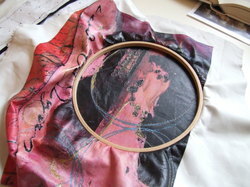 I had a wonderful drive out to Derbyshire last Friday to get Jen's arwork printed onto the leather for the corset for the exhibition. And it just looks better than I had even imagined!! The colours are so divine (there will be progress photographs in the next couple of days I promise!!). At first I couldn't decide between a beautiful aged creamy leather or a darker leather but in the end decided on a pale glove leather which just makes the colours sing out and makes it so true to the original piece which Jen emailed to me. Now I just have to make the corset!! 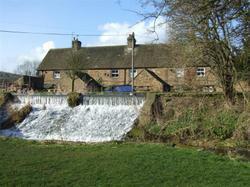 After the leather shop I went to Cauldwell's Mill which is in the Peak District and is a working Mill with coffee shop, gift centre and artists workshops. 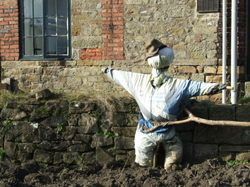 This fellow above is there to greet any arrival to the coffee shop - and I treated myself to what has to be the most gorgeous home made soup and cake in the county!!! Just have a look at this! It is such an old fashioned place filled with history and I would really love to read more about them. I am sure there are many tales and adventures to discover about the history of the places and the people. It is our dream to eventually buy and old stone cottage there with maybe enough land to build a studio in the gardern for me. I would love to have a few ducks and a river or a stream at the end of the garden - just how divine would this be!! Of course who knows how possible that would be - prices are prohibitively expensive and it is only the city dwellers who are rich enough to have second homes or holiday dwellings who can really afford this - but a girl can dream!! I mean who wouldn't want to wake up to these views every morning! Saturday morning we drove out to a farmers market and bought so much food!! All fresh vegetable and glorious bread and other tasty delights. I think this just shows that we are really country bumpkins at heart - forced through finances to live the city life for now - but we will get where we want to be - I am ever hopeful!! Poor Mark - I do feel bad for him. He is on holiday this week from work but as luck would have it, or bad planning, or just the way life works - I of course am really busy preparing for the exhibition. This always seems to happen when he is on holiday. I have some other thing going on and cannot really take time off. And even worse than that (although I am sure he would try to deny it!!) is the fact that our main PC seems to have picked up some life threatening illness and is just sitting in the corner of the room a big hunk of useless metal. So Marks dreams of a week playing World of Warcraft or whatever it called have had to be abandoned. So he is feeling a wee bit sorry for himself. Of course I have tried the 'life could be worse dear' words of wisdom which haven't gone down too well!! So the droopy petulant bottom lip continues. Poor dear. We did decide that maybe we could go away for an overnight trip up to the historical city of York and eat out and have coffee and be tourists for 2 days at the weekend but at the moment it is dependant on how I get on with my work this week. And knowing my complete inability to judge my time and how long it takes me to complete tasks I have to say that I not too hopeful!! But how do I break it to him?? Oh dear - to have to be the bearer of bad news. Any other time I would have been able to have worked day and night to get my work done so we could go away but alas I am not sure my back is up to it at the moment. I shall just have to put out a wee advert for some fairies or elves who can work at some handstitching whilst I am sleeping - just like that wonderful fairy tale of the elves and the shoemaker that I so loved as a child!! Oh but where to find them?? I have discovered so many beautiful and wonderful blogs and inspiring creators on the internet the past few weeks. I am so dying to highlight them here - maybe when I have a little bit less on my plate then I shall trawl through the bookmarked pages to show you!! I am still such a slow bunny on the internet - when will i ever get used to links and html and all these things that are so foreign to me!! No artwork to show you today. 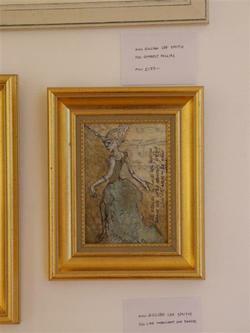 But I did sell 'Sophia' the same day I listed her last week (she is on my last blog post) so was over the moon. 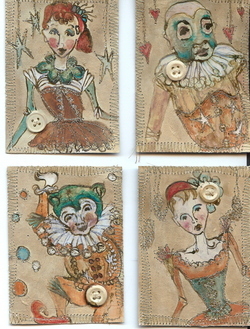 After the exhibiton I am so looking forward to working on loads more pieces of small art for my etsy shop. I have a couple more ACEO's to list but that may have to wait till tomorrow!! It will give me a reason to update my day on here again - I so want to get into the habit of saying hello much more regularly as it is the highlight of my day reading all of your posts and thoughts and seeing your work. Ok my lovelies - back off the spare room for me - there is work to be done!!! Have a wonderful day wherever you are!! Ongoing projects are continuing - the burlesque exhibition looms - 10 days I think until D Day - 10 days!!!! How can that be! The leather is to be printed tomorrow - now that I am so excited about! So the plan is that there will be 2 new corsets including the collaboration with the beautiful stiletto heights which will be hung on gorgeous ribbon covered hangers on the wall (hangers still to be made). 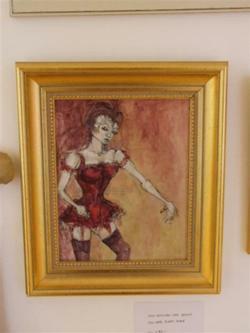 I am also working on 2 framed pieces inspired by burlesque and incorporating costume ideas. I would have loved to have found some stunning ornate antique gold carved frames to put them in but alas I think I have left it too late to make a miraculous discovery such as this - unless I have time to go antique shopping next week and they by some stroke of luck fall at my feet I cannot imagine I will make such a find. Unfortunately my back condition has made life a wee bit difficult since my last post (I am now being put on a fastrack to an appointment at the spinal unit - so am not sure how long that will take 'fastrack' could mean anything!!) so my dreams of making a fabulous, glitzy and spectactular new burlesque costume for the exhibition has not really been possible - I am trying not to worry about it though. Money is a wee bit tight so it was probably a bit too ambitious anyway. I would much rather make a few well made pieces and be happy with what I have achieved, than rush to make a full costume which I feel is rushed and not well made. And in other news!! Well I have been putting more small art pieces in my etsy store the last couple of days which I am happy about. I am still finding my way and really just spending time happily at my work table drawing away and I really have not been thinking about what others may feel about the pieces or what the response would be. But I was absolutely over the moon yesterday when the above piece The Masked Ball sold within a few hours of putting it in my shop!!! The thought that someone, somewhere saw this and loved it enough to want to own it just overwhelms me!! I am not sure I will ever get used to that feeling - in the best possible way of course. It will never cease to delight me. I love making the cuffs and corsages and the bags, but my aim is to really begin to fill my shop with much more original pieces. More artwork and original accessories such as art inspired belts and even sculptural pieces. I feel I am slowly making my way there and each piece that I sell encourages me to make the things I love. Inspired by Creative Challenge #40 this illustration represents to me our past transgressions against nature and in particular the animal kingdom. Caging animals for their beauty has now led us to cage animals in order to ensure their survival – at least in some forms. I am a huge lover of museums and have often been inspired by the animal sections, however the rows and cabinets and cases of stuffed animals has often led me to wonder where they came from – especially the rare species. Surely they could not have been collected purely to be encased in dusty old Victorian cabinets – I hope not but I do fear that is the case. Endlessly fascinated by cabinets of curiosities though for their sadness and their beauty I guess I love to include them in my work. I haven't managed to submit it yet so that is my next task for today. And this is another piece going in my shop today. Sophia is again inspired by my love of victorian photographs of obstinate children, dressed in beautiful but constrictive victorian clothing, and clearly bored to tears by the trauma of the length of time it took to take a photograph. I just adore them!! Okay my lovely and beautiful blog friends - I have to get back to work now, but will it be to the spare room to sew or to the dining table to paint and draw and dream - I am not sure. Gosh this has been a very serious and tack orientated post! But such is my life at the moment I guess. I must, must, must take my camera tomorrow for my drive to the green rolling hills and valleys of derbyshire where I am going to get the leather printed. 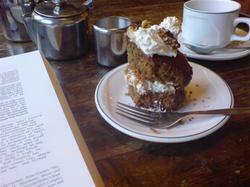 I may even stop off for tea and cake on the way!!! 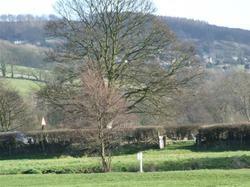 And I must have photographs to show you for the next post - oh yes that is what I shall do!!! Take care! !